If you are looking for my Mojo Monday card, please scroll down or click HERE.. Thank You! Hi there! Have you seen the new Taylored Expressions June Key Ingredients? The team has been showing some fabulous projects on The Key Ingredients Blog this week! Today is Day 4 of June projects, and it is my day to show what I've come up with.. Here's a little sneak peek of my project (if you'd like to see more, please click HERE!).. Love your project on the blog today!! I need to make one of the bookmark. Such a great gift idea! What a pretty sneak peek! Off to see the rest! Such a sweet project Stephanie! 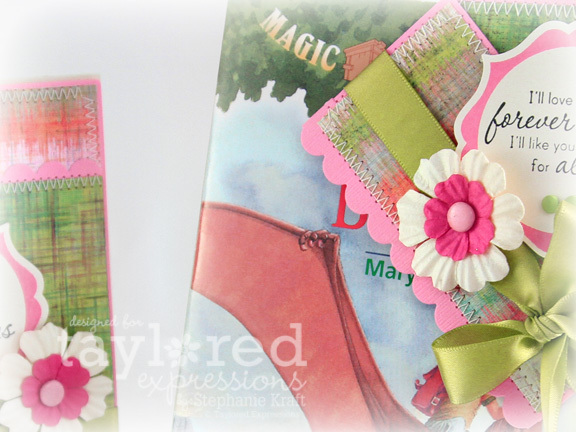 Love that pink label and matching die! Fabulous projects using this months KI kit Stephanie! I love your pretty bookmark and card! I recognize that magic tree house cover. :) Gorgeous bookmark!